The story sounds like something out of a movie. 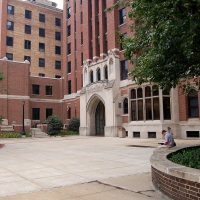 In 2017, a talk show host on the Moody Radio Network blows the whistle on the leadership of one of American evangelicalism’s flagship institutions, the Moody Bible Institute (MBI). On Jan. 9, 2018, she escalates the pressure with a hard-hitting headline on her blog: “A Luxury Suite, Questionable Loan to Officer, & Gambling: The Disturbing Truth About Leadership at MBI.” Moody within hours fires her and sends a man to her house to seize her laptop—but she is on her way to Mexico, with the computer. So, even though the saga is not over, the Moody board’s action is still a man-bites-dog story within the usually slow-moving world of higher education. As the news spread, Christian leaders asked questions: What are MBI’s problems? What forced the hand of the board, and where does Moody go from here? Is the drama likely to be repeated at other institutions as financial and theological pressures grow? WORLD had been investigating MBI during the weeks before the board decision, and we have some findings to report. COLLEGES LIVE OR DIE ON STUDENT ENROLLMENT. From 2012 to 2017, the number of students applying to MBI fell from 1,316 to 947—a 28 percent drop. MBI for more than a century has emphasized theological education for students who desire to enter full-time vocational ministry: “Those are the students we still give priority to,” said James Spencer, vice president and dean of Moody’s undergraduate school. Today, though, many young Christians look to secular careers and speak of ministering informally within their professions. This entry was posted in Ministry, Opinion/Commentary, Postmodern Church/Apostasy on January 24, 2018 by Truth2Freedom.